Back cover blurb: 1919. The Derbyshire village of Wenfield is still reeling from four terrible years of war, and now, just when the village is coming to terms with the loss of so many of its sons, the brutal murder of a young girl shatters its hard-won tranquillity. Myrtle Bligh is found stabbed and left in woodland, her mouth slit to accommodate a dead dove, a bird of peace. During the war Myrtle worked as a volunteer nurse with Flora Winsmore, the local doctor's daughter, caring for badly wounded soldiers at the nearby big house, Tarnhey Court. When two more women are found murdered in identical circumstances, Inspector Albert Lincoln is sent up from London, a man not only wounded in war but damaged in peace by the death of his young son and his cold, loveless marriage. Once in Wenfield, Albert begins to investigate the three recent murders and the Cartwright family of Tarnhey Court and their staff fall under suspicion as their hidden lives and secrets are uncovered. With rumours of a ghostly soldier with a painted face being spotted near the scene of the murders, the village is thrown into a state of panic - and with the killer still on the loose, who will be the next to die at the hands of this vicious angel of death? For me this novel started off with such promise, a post WW1 with a difference. Sadly I was left a little disappointed by its conclusion. Although others may enjoy this novels ending. A high mortality of doves is ultimately Flora Winsmore's story. A doctor's daughter who voluntereed as a nurse during the war, Flora is a feeling a little low at the prospect of post war life. Her Father doesn't want her to train to be a 'proper' nurse, but Flora is desperate to be one. When a young local woman, Myrtle Bligh is murdered, Flora hurries to be at her Father's side as he called to the scene as a Doctor. Barely disturbed by what she sees - after all she was a nurse during the War.. Flora is secretly a little thrilled as tragically more deaths descend upon the village of Wenfield. As more grisly murders occur, a detective from Scotland Yard is called upon to help the investigation. As an outsider Albert Lincoln is not afraid to question those in the village who the local police might think above the law. 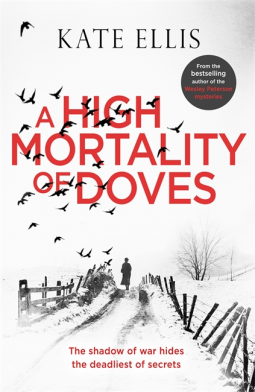 A high mortality of dove is available to buy now via Amazon online and all good book shops.